Will Snow Stop Ant Activity? In the summertime, it is not uncommon to see a trail of ants marching one by one toward a food source. Once the temperature drops and the snow begins to fall ants, like most insects, tend to disappear. But have they actually ceased working, and what does it mean if you find them inside your home during the winter? When the temperature outside reaches around 50°F, ants begin to prepare for the long winter ahead. Many species consume vast quantities of food in the fall to amass enough body fat to live through the winter months. Some ants even produce a substance similar to antifreeze that protects their bodies from succumbing to otherwise lethal temperatures. The ant colony seeks out warmer places to overwinter, such as below the frost line or underneath rocks and tree bark. Eventually, the entrance to their nest closes, and the ants pass the winter in a relatively dormant state known as diapause. They will use stored fats and carbohydrates to survive until rising temperatures lull them out of hibernation in the spring. Temperatures temporarily increased long enough to trick the ants into coming out of hibernation. New England winters are unpredictable at best. This year, we have seen a 65-degree fluctuation within 24 hours! If the temperatures stay warm long enough, dormant ants could become active and begin foraging for food. However, once the temperature drops back down this activity should cease. They hitched a ride on firewood. A primary source of heat for many New Englanders is the wood stove. Many of us have vast quantities of firewood stacked and ready to burn. As mentioned earlier, tree bark is one of the places ants (and other insects) seek out to overwinter. So by bringing in a handful of logs from outside, you may also be welcoming slumbering ants into your home. They’ve taken up residence somewhere inside your home. If a colony’s summer home is within proximity to your house, they may have their sights set on moving in with you for the winter. Our homes offer everything a colony needs: heat, shelter, food, and moisture. One ant to be on the lookout for is the carpenter ant. It is typically black in color and up to ½ inch long. 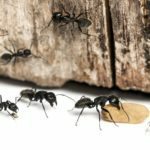 Carpenter ants build their nests in wood and could damage the infrastructure of your home if they are nesting within your walls. Before winter sets in, seek out possibly colony sites near your home. Including outdoor wood piles, under rocks or bark, or within rotting tree stumps. It’s important to remember that if you had an ant issue in the spring or summer, winter alone will not solve your problem – they will come back! Get rid of potential food sources, such as crumbs in the kitchen or sugary spills. Keep your counters and under cabinets clean to make them less appealing for hungry ants. Limit the moisture havens in your home, such as damp towels on the bathroom floor and leaking sinks. Replacing moist, rotting wood will make your home less attractive to carpenter ants. Locate the nest location, if possible. 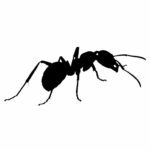 Winter ant sightings are a good indication that there is a nest within your home, and finding the source is imperative for efficient treatment.